How many bertha armyworm adults are in this jar? Take the quiz to find out. 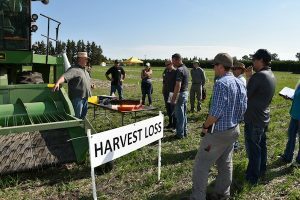 The Canola Council of Canada, Alberta Canola Producers Commission and Agriculture and Agri-Food Canada (AAFC) presented the first ever canolaPALOOZA at AAFC Lacombe and AAFC Beaverlodge this week. The event featured lots of hands on agronomy, leading experts and fun — including a dunk tank, slap shot contest, and food trucks. Our top 10 list includes just a sample of the agronomy messages growers and agronomists heard during the day. Search #canolapalooza on Twitter for more comments and images. Patchy emergence due to a few weeks of dry and then a rain, or due to reseeded crop emerging among the few original plants, has created a wide range of stages in some crops. Make herbicide timing decisions based on the stage that represents the highest proportion of plants. 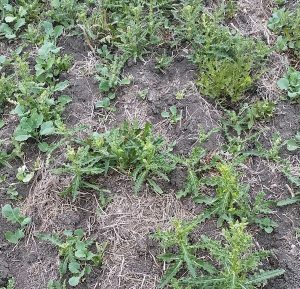 And rather than planning on two applications, growers may be better off spraying once at the highest registered rate when weeds that are more advanced than the crop, and with rapidly growing canola plants. 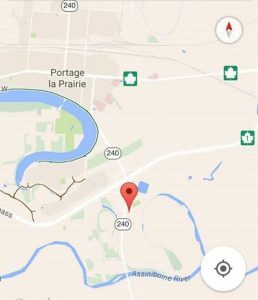 Here is a quick update on the Portage la Prairie UCC Site. Ideal temperature and moisture conditions have promoted fast crop growth this past week. The trial site has received approximately 8-9mm of rain. Daily maximum temperatures have ranged from 23-28. Thus, the crop has jumped from the 2-3 leaf stage to the 4-5 leaf stage since my last post! The Manitoba 2015 Ultimate Canola Challenge plot is located South of Portage, along highway 240 towards South Port. The exact location is Lot 107 in the Parrish of Portage. In this area the soil is an Elm River Silt Loam. June 17 Quiz — What is this we found? This is a good week to be out scouting for situations that require immediate management, continued monitoring or detailed note-taking to make amends next year. Drill performance issues are a good example of the third situation. 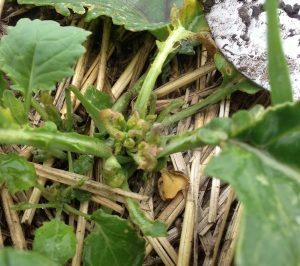 The following photos show damage observed in canola fields in the past week across the Prairies. Can you identify the cause for each? Canola plants have been going through a lot of stress, and could be showing multiple symptoms. Good sleuthing means leaving the truck seat, putting on your booties and walking the fields. Getting to the bottom of any mystery takes keen observation (got your magnifying glass? ), an open mind (the most obvious answer is not always the right answer) and a touch of skepticism (not everything can be cured with a splash of this and that). This article has tips and links for information on spraying in windy conditions, when to spray uneven crop, spraying at the right crop stage, sprayer clean out to prevent crop damage, and Keep It Clean tips for new products. Herbicide damage to canola can take many forms. Here are some clues to look for…. The later hail occurs, the higher the chance of yield loss, given that the plants have less time to recover. Plants with a broken main stem will likely die. 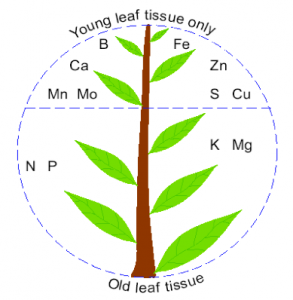 Plants at the 6-leaf stage that lose most of the leaf area on the main stem can still live, but these leaves will not regrow. The plant will be delayed, and more of the yield potential — which will be lower than before the hail — will come from side branches. 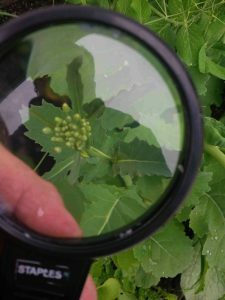 Canola Discovery Forum tracks canola and the science behind it. Growers share their experiences and we build on that knowledge to identify research priorities and inspire collaborative efforts between academia and private sector companies. The goal is to seek strategic opportunities to facilitate risk reduction and advance the growth and profitability of the canola industry.